Organic mixed dal tadka is made of 5 different lentils: red lentils, split chickpea lentils, split black gram, split pigeon peas and split green mung beans. As these lentils are split they don’t require to be soaked for a long time before cooking. This makes it easy to digest. This Indian dish is high in dietary fiber and an excellent source of protein. Once the mixed dal is cooked, tempered spices are added, which is known as tadka. The tempered spices add flavor to the dal preparation. 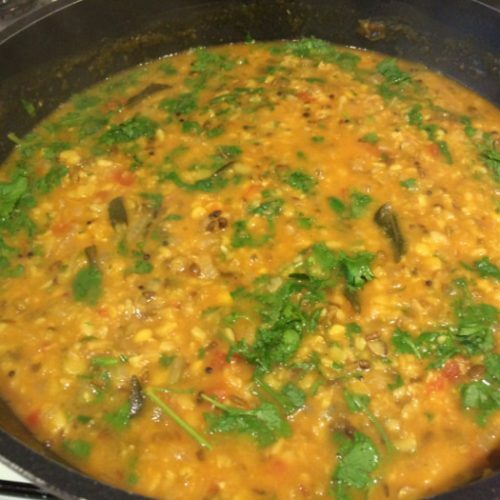 Organic mixed dal tadka is vegetarian and gluten-free. For a vegan version, just replace the butter or ghee with oil. Perfectly balanced organic vegetarian/gluten-free/vegan, healthy dish, made with organic lentils and spices for flavor and great taste. Soak 1 cup of mixed lentils for 3 hours if you are using a pressure cooker to make the preparation. If not, soak it overnight. Wash and drain the lentils until the water runs clear. Add water to the pan, boil the lentils, and remove the froth. Add 1tsp of salt and ½ tsp of turmeric. Cook the dal in a pressure cooker for 4-5 whistles or 30 minutes. If you're using a pan, boil it for an hour until the lentils are soft and cooked. Add 1 tsp of black mustard seeds. Wait for them to start popping. Turn the heat down a little when that happens. Thereafter, add chopped onions followed by a pinch of salt and some black pepper. Stir the onions on medium heat, till they turn golden brown. Add 1 tbsp of ghee or butter, and then add garlic/ginger/green chili to it. Lower the heat if required, and ensure that you do not burn the garlic/ginger. Cook the same for 3-4 mins until the onions start to brown. Add ½ a tin of tomatoes, followed by coriander/ cumin powder, garam masala, red chilli powder, and Kashmiri chilli powder (a spicy variant of red chill powder). Cook for 10 mins and stir. Add 1 tsp of tamarind paste (this is optional. One can also use 1tsp of lemon juice instead of the tamarind paste). Cook with a lid for 15-20 mins until the tomatoes separate from the oil. Add coriander leaves to the preparation. When the dal is cooked remove cinnamon sticks and the whole cloves before serving. Serve it with basmati rice OR parathas/chappati (Indian flat bread). Palvesh Patel is a health and nutrition enthusiast who set up Wholesome Fine Foods, in 1996, that imports and distributes health and fine Food products in the United Kingdom. In the last few years, he has specialized in a range of Organic foods, certified by EU and USDA standards.